What Causes Sagging, Sinking Crawl Spaces -- And How To Fix It Permanently! 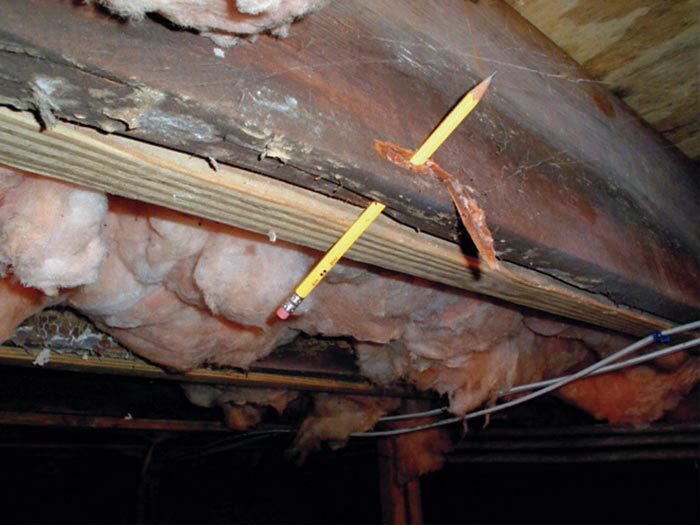 An surprising number of crawl spaces have an insufficient or poorly designed structural support system. 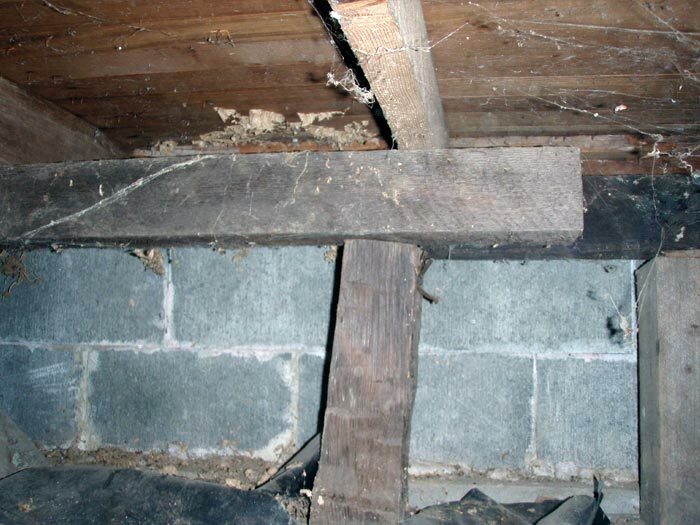 As these structural supports begin to fail, it can lead to a long list of problems in the home. Addressing the issue early on is the best and most cost-effective way to protect your home from damage. When a crawl space begins to sag and sink, the entire house that rests on it can begin to suffer. If the problem is allowed to develop, the symptoms will become varied and more severe. If left long enough, the damage can potentially worsen until the floor caves in entirely. Why Choose A Crawl Space Professional? A crawl space expert specializes in this environment, and has seen what works (and what doesn't) by having observed thousands of crawl spaces over the years. Because of this, they will be able to provide you with a faster, more reliable, and warrantied repair for your below-grade space. At Basement Systems, our Certified Dealers have access to more than 30 warrantied, award-winning products that are designed to keep your basement or crawl space dry all the time! To schedule a free crawl space repair quote, contact us by phone or e-mail today! We'll get you in touch with your local dealer, who will provide you with an on-site inspection, professional consultation, and customized cost quote. If your crawl space is suffering from rot, mold, and moisture damage, the key to preventing new damage is to dry and seal the space with a vapor barrier. 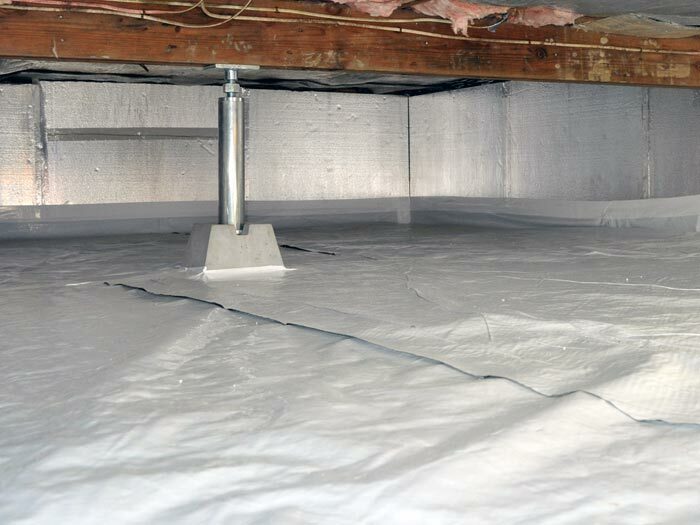 At Basement Systems, our dealers can waterproof, dry, and insulate your crawl space, converting it into a healthier, longer-lasting space that can be used for storage. 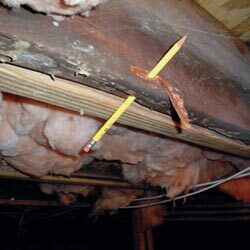 Too Few Crawl Space Supports: Many crawl spaces are built with supports that are spaced too far apart to properly support the weight of the home that's bearing down upon them. 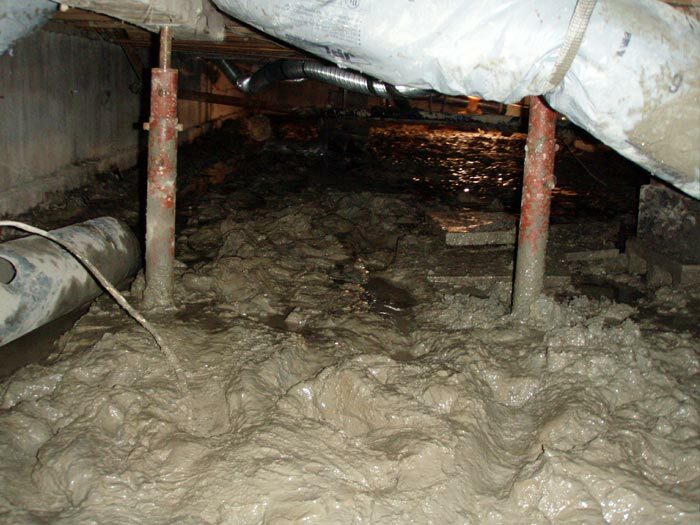 Sinking Crawl Space Supports: When the soils are not strong enough to bear the weight being transferred through the supports, then the soil will compress, and the supports will sink. 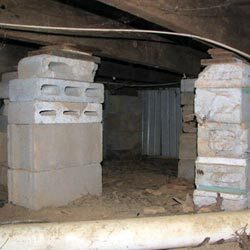 Rot, Mold, & Moisture Damage: If a crawl space is wet or humid, it will support the growth of mold, mildew, and rot. 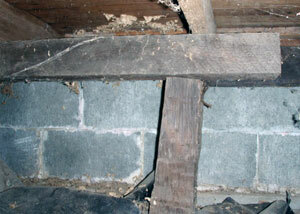 As this mold damages the structural wood in your home, the structure can begin to sag. Termites & Pests: Insects such as termites, carpenter ants, wood-destroying beetles, and others love the warm, dark, moist environment that's common in crawl spaces. Approximately 1 in 30 homes are infested by termites annually. In each of these cases, the damage can be repaired by sealing the crawl space, addressing any moisture sources, and adding additional structural supports. As with most home improvements, some crawl space structural repair methods are good, others are great, and some hardly seem to work at all. There's a lot of crawl spaces out there, and contractors take many different approaches for repairing them. Summary: The floor is lifted upwards, and blocks of wood are used to fill in the gaps between the tops of the supports and the lifted floor. 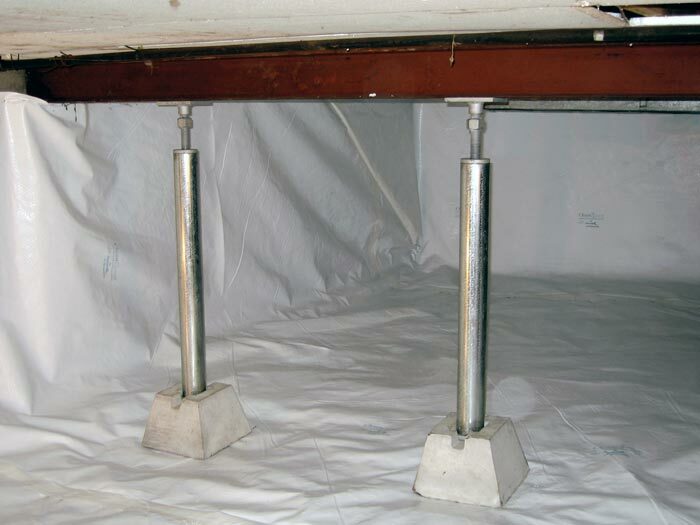 If crawl space supports have sunk down into the earth, some contractors will try to extend the height of the supports by adding additional shimming. This process involves mechanically raising the floor, overlifting it to above its proper position. Pieces of wood or metal are then inserted into the gaps along the tops of the support column. Then, the structure is lowered on top of the "extended" columns. Overlifting a floor to above a level position can cause additional damage to your structure. The soil underneath the support posts still can't support the weight of the house. The shimming process will need to be repeated regularly. Summary: All rot-damaged wood is ripped out and removed. The crawl space structure is completely rebuilt using new wood. Sometimes, a homeowner will opt to have a contractor rip out all the mold- and rot-damaged wood and replace it. Of course, hiring a contractor to crawl into a dank, mold-filled crawl space, rip all the wood out, and replace it in close quarters can get really expensive! The problem with a solution like this is that it never really addresses the mold and moisture that allowed the damage to occur in the first place. If those factors aren't also addressed, the new wood will eventually rot as well. While rot-damaged wood will often need to be replaced or reinforced, this addresses only half of the issue. To ensure a more permanent solution, all sources of water and humidity will also need to be addressed. Summary: The floor is lifted upwards, and supplementary concrete columns are installed in the crawl space. Shimming is used to fill in the gaps between each column and the floor. 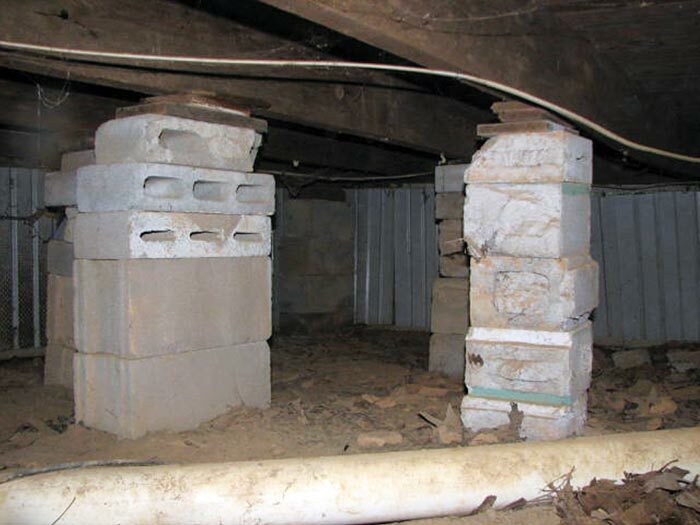 Many contractors will recommend to homeowners that they install concrete masonry unit columns (CMU columns) in their crawl space to add support to a sinking foundation. Traditional CMU columns are installed in at least three visits, which are separated by several days each due to the curing time of the concrete footings and concrete block mortar. Of course, the concrete blocks used in these columns will not be able to lift the floor back to position. Once the CMU columns are in place, the floor will need to be overlifted, and shimming will be added. 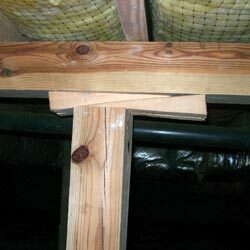 As mentioned above, this process can potentially lead to further structural damage to your home. Summary: Lightweight, metal, portable support jacks are installed in the crawl space on crawl space blocks placed on the floor. Each is adjusted (without shimming) to the appropriate height. More experienced contractors will often opt to install crawl space jack posts in order to repair structural damage in a crawl space. 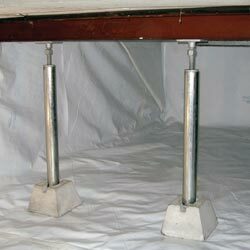 When installing light-duty jack posts, they will position an adjustable, lightweight, metal post on a concrete block that's resting on the crawl space floor. 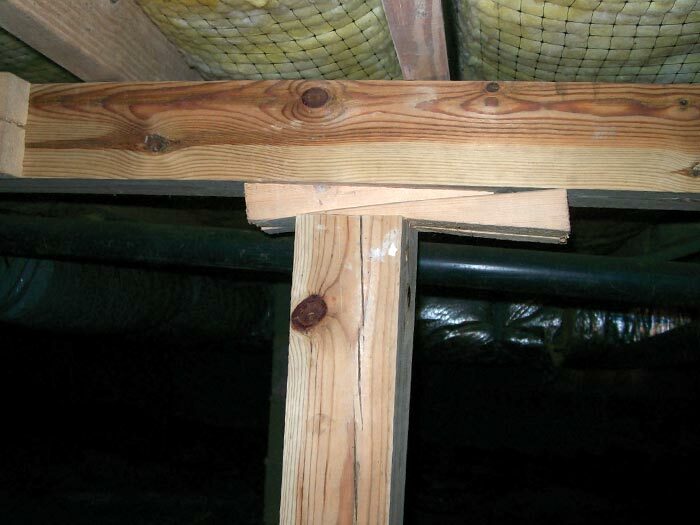 The jack post can then be extended until it reaches and supports the sagging girder. Light-duty jack posts, however, are best as a temporary solution. They have a low load-bearing capacity, and can rust or corrode over time, making it impossible to adjust them. Additionally, they can sink into the soils, leading to further structural sagging in the future. Summary: Heavy-duty metal supports made from galvanized steel are installed in the crawl space on a specially-designed base. Each is adjusted (without shimming) to the appropriate height. At Basement Systems, our experts recommend installing a heavy duty jack post system -- particularly our award-winning SmartJack® Crawl Space Jack Posts. The SmartJack® System is a powerful support system, with each able to support a bearing load of over 60,000 pounds -- up to four times the capacity of many light-duty posts. It's portable, adjustable, and a typical installation takes less than a day. In cases where rot has severely damaged the girder and joists, a new sister beam will be installed alongside the original support to add strength. This system is designed with galvanized steel, making it corrosion-resistant for long-lasting adjustability and allowing for its written 25-year warranty. The SmartJack® Won't Sink Into The Soil! One major weaknesses among all other repair options is this: no matter how strong they are, they're limited by the bearing strength of the soil they're resting on. Not so with the SmartJack! Before each SmartJack® is installed a 2' cube is excavated below the installation spot and filled with a compressed gravel fill. A pre-cast concrete footer is placed on top, and the SmartJack® is positioned in the footer during installation. By calculating the depth of the fill at twice of the bearing width (with a 2' cube bearing a 1' concrete footer), the bearing stresses on the foundation soils are dissipated to approximately 10% of the stress experienced on the bearing surface. This ensures that even with weak supporting soils, the bearing weight of the SmartJack® system is ten times more than comparable systems installed directly on a dirt-floor crawl space! We Can Fix Your Sagging Crawl Space! At Basement Systems, our dealers have the experience, training, and award-winning products you need to permanently repair your crawl space. Our experts can repair your crawl space quickly -- with a complete crawl space system often being installed in a day or less. It costs you nothing to meet with a professional for a free inspection and estimate! 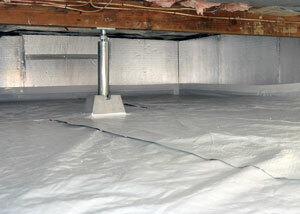 To set up your free crawl space repair quote, contact us by phone or e-mail today! Do I Need A Waterproofer Or A Foundation Expert?